The movement to creating Smart Factories through manufacturing automation and streamlined data exchange is changing the way things are being made, and software-defined networking is at the forefront of network technologies enabling this transformation. Industrial IoT (IIoT), machine to machine (M2M), the cloud, wired and wireless networks and the expanding network edge of a global supply chain are now requirements for competitive manufacturing. The IDC Manufacturing Predictions 2018 study says that by 2020, 60 percent of G2000 manufacturers will rely on digital platforms that support 30 percent of overall revenue. Manufacturers working to increase productivity in this new global manufacturing economy are realizing that the goal of fast and agile data throughput and access must be balanced with proactive security and compliance. In this type of evolving manufacturing landscape, networking is the linchpin for achieving those possibilities. Manufacturers can do this by introducing digital transformation holistically from the factory floor to beyond the network edge. Software-Defined Network (SDN) is emerging as the ideal solution for meeting the needs of manufacturing. However, SDN for manufacturing enterprises only becomes a clear solution when you understand how it can be applied to address the evolving challenges and pain points across an expanding manufacturing ecosystem. Consequently, it’s important to have a way to integrate internal visibility of production processes and networking with external supply chain operations and logistics. The solution must be infinitely agile to enable real-time changes relevant to the manufacturing cycle while eliminating the network silos of IT and operational technology (OT). SDN for manufacturers can deliver the convergence of data-centric computing of IT with OT’s event, process, and device monitoring. This enables simplified adjustments in enterprise and industrial operations. IIoT and sensor technology are crucial to manufacturing by tying critical operational and control data from shop floor equipment and robotics to product and materials movement, vehicle fleets, and material handling systems. This data is constantly being produced and directed through wired and wireless IT/OT networks and the cloud to beyond the network edge. Today, applications and their access determine if manufacturing entities can support given initiatives. Manufacturers must be able to build such applications, make them agile, deploy them globally and make them securely available to end users. Software-defined networking for manufacturers can meet all of these needs. Finally, SDN presents real cost-saving opportunities as traditional hardware and network design methodologies in manufacturing networks are unsustainable and incompatible with digital transformations. Cisco’s SDN solution offerings can improve security, reduce operating expenditures, improve compliance and optimize the user experience. An SDN solution allows administrators to design the network, provision networking gear programmatically and enforce group-based policies to secure the network. 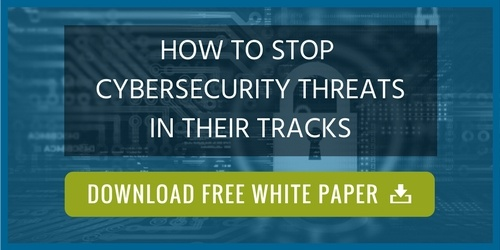 Using role-based access control, white-listed users and devices can only access applications and resources they are explicitly given permission to access. Today, SDN continues to evolve in ways that enable even greater network agility through cloud-based platforms that can deliver Intent-Based Networking (IBN). In general, IBN replaces manual configuration of switches, firewalls and other infrastructure components through the command-line interface (CLI) with automation and orchestration. This new approach to SDN for manufacturers facilitates planning, design and automatic implementation of on-the-fly changes to the network for greater availability, agility, security, and reliability. An IBN solution using Cisco’s SDN technologies can enable true IT/OT convergence through segmentation that enables rapid creation, changes, monitoring, and deletion of network services as needed. 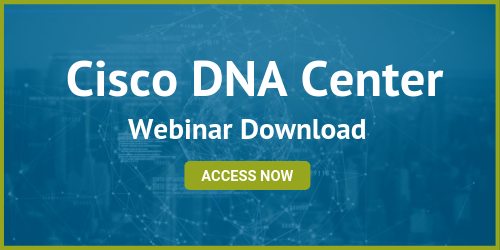 Ultimately these next-generation SDN solutions provide smarter end-to-end network control, automation, and service agility so that your manufacturing environment can quickly and easily meet IT and OT needs today and tomorrow. 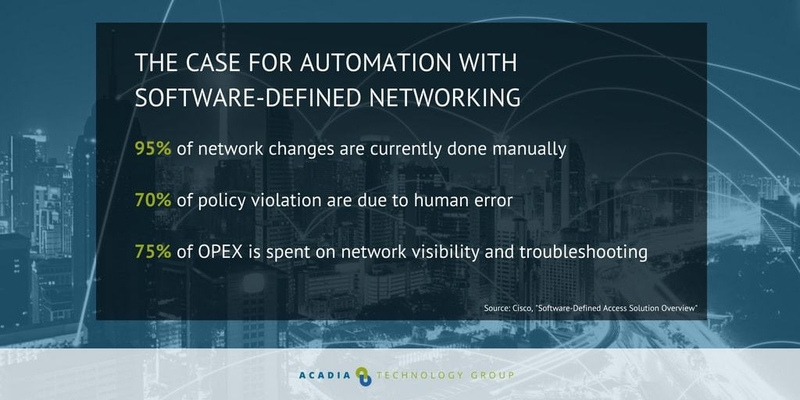 As a skilled and expert Cisco partner, Acadia Technology Group is ideally positioned to provide you with clarity and context for the usage of Cisco’s SDN solutions in your network.